With increasing and intense competition in the marketplace, businesses and products are becoming highly commoditized. 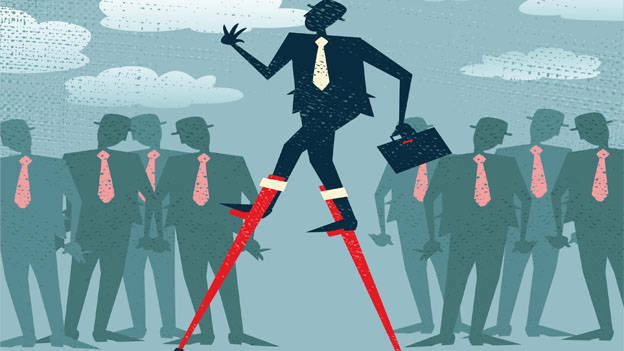 Differentiation is the key and products and services that cannot distinguish themselves from the others in its 'peer' category have hardly any takers. Technology, location, product and service features, distribution channels, infrastructure contribute in a limited way towards competitive advantage as they can be easily replicated. High degrees of customer focus and relentless innovation have become the cornerstone of execution excellence and people are at the center of both customer focus as well as innovation. It is no secret that execution excellence today plays a decisive and key role in creating competitive advantage for firms and businesses. As a matter of fact, execution excellence is the only sustainable competitive advantage with people and organization culture at the forefront. Excellence is not about doing different things but doing the same thing differently. This is, largely influenced by people attributes such as motivation, creativity, rigor and drive. Thus, it becomes imperative for the leaders to showcase such attributes and lead from the front while driving execution excellence. A concrete vision and leadership conviction is critical here, which also has the potential to solve challenges and dilemmas. Creating a team that believes in doing things differently (faster, easier and more accurate) is vital as people with similar mindsets can synergistically collaborate and promote execution excellence. Close monitoring and control is another key parameter as this ensures that creativity and flexibility is kept within bounds and one does not lose sight of targets and time-lines. Excellence is characterized by adherence to time-lines and it is important for the leader to keep this in perspective. There should never be a compromise between cost of excellence and achievement of results within set deadlines. An interesting survey by HBR clearly points out that 3 out of every 5 companies (out of 1000 companies surveyed over 50 countries) rated their organization as weak at execution – that is, when asked if they agreed with the statement "Important strategic and operational decisions are quickly translated into action," the majority answered no. However, there are organizations that excel at execution. GE prides itself on driving rigor, operational excellence and enhanced customer value as part of its execution strategy with 'people' at the core. It has outlined 40 high impact projects that will enhance speed to market, improve the quality of products and services, significantly reduce costs and drive competitive advantage for the company and its customers. Google, as part of its relentless pursuit towards execution excellence, encourages every employee (Googler) to innovate. They are expected to spend a sizeable chunk of their time and energy on pet projects and then run many of those to see if there are customers who will salute them. Larry Bossidy and Ram Charan in their much acclaimed book ‘Execution: The Discipline of Getting Things Done’ define execution as a specific set of behaviors and techniques that companies need to master in order to have competitive advantage. Dialogue, according to them, is the core of culture and basic unit of work; and how people and leadership talk to each other determines how well the organization will function. 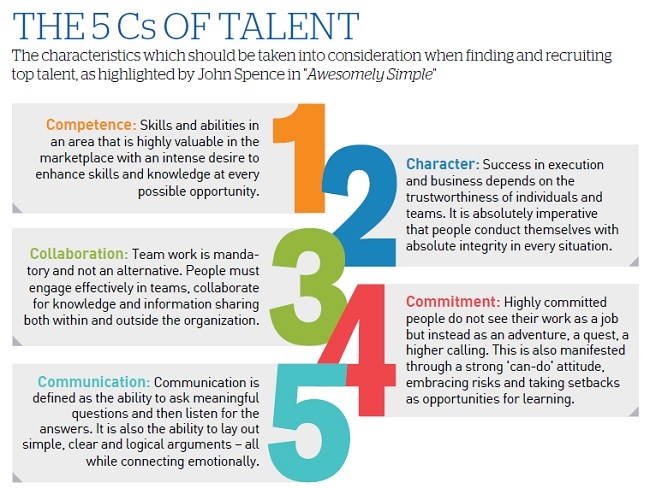 In his book, John states that finding and recruiting top talent must take into consideration the five C's of talent. Constantly seek and be on the look-out for top talent through associations and representations, universities and colleges. A global hiring program in the organization that seeks to recruit and train the best within a specified time-frame. This, however, needs to be in line with the organization’s expansion plans. A ‘fast track’ mechanism through which top potential can be channelized for quick transition into leadership roles. This may include exposure to challenging assignments early on in their careers. An internship program that provides a window to talented people to come in and work before they can be considered for hiring. Assess competencies of potential talent through ‘assessment centers’ (as against an ‘off-the-cuff’ approach) for role fitment. Study the best practices in 'peer' organizations for talent acquisition and retention. A critical issue to point out is that business execution is a process without an end. Broad strategy and direction may not waver but the priorities and their implementation may change due to the dynamic nature of business. A business execution plan ensures that people know these priorities and are constantly focused on them. It is imperative that an organization's goals, people and work processes are clearly aligned since they constitute the essential elements of successful strategy execution and a more profitable business. People performance is a core aspect of execution excellence i.e. the right people in the right jobs doing the right things day in and day out. Aristotle has succinctly remarked - "We are what we repeatedly do. Excellence, then, is not an act, but a habit."